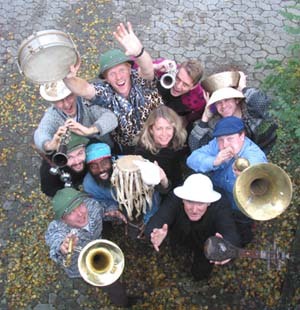 Pierre Dørge & New Jungle Orchestra have been around since 1980 - with some changes in the crew. They play world music on the highest level and they are in a class of their own. With a mixture of jazz, Asian, African and European music - and general madness - they create their own dadaistic universe, which gives the audience a unique and extraordinary experience. As is often the case, they are best live on stage, where you can hear music created by the saxophonist chewing on his leaf or Pierre playing a musical box as you know it from the kids room. Other instruments are sea shells used as trumpets or various Asian and African remedies. There are no limits and the catching joy and humour almost always guarantees a memorable concert for years to come. Pierre Dorge is a worthy heir to the Ellingtonian legacy. In the last few years the band has been playing all over the world. In 2005 they celebrated their 25 years jubileum. "The Danish guitarist creates an exotically hued, rhythmically vibrant music that is simultaneously sophisticated and accessible. Pierre Dørge & NJO has been one of jazz´s most consistently engaging big bands of the last decade." 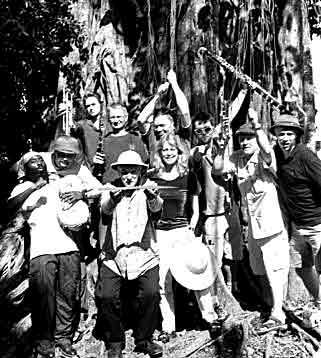 "The New Jungle Orchestra is sponsored and financially supported by the Danish Arts Council "
Pierre Dorge & New Jungle Orchestra have been around since 1980 - with some changes in the crew. They play worldmusic on the highest level and they are in a class of their own. With a mixture of jazz, Asian, African and European music - and general madness - they create their own dadaistic universe, which gives the audience a unique and extraordinary experience. As is often the case, they are best live on stage, where you can hear music created by the saxophonist chewing on his leaf or Pierre playing a musical box as you know it from the kids room. Other instruments are sea shells used as trumpets or various Asian and African remedies. There are no limits and the catching joy and humour almost always guarantees a memorable concert for years to come. Pierre Dorge is a worthy heir to the Ellingtonian legacy. In the last few years the band has been playing all over the world. In 2005 they celebrate their 25 years jubileum. "The Danish guitarist creates an exotically hued, rhythmically vibrant music that is simultaneously sophisticated and accessible. Pierre Dørge´s NJO has been one of jazz´s most consistently engaging big bands of the last decade." ''This amazingly exuberant Ellingtonian based 10 piece jazz orchestra led by legendary guitarist and exotic composer Pierre Dorge with saxes/trumpets/trombones/and an elaborate full rhythm secton with bass/piano/guitar/drums/percussion, plays a blend of traditional and world-jazz cross-cultural rhythms, and is "unabashedly one of Europe's most sophisticated jazz bands". One the world's most internationally travelled jazz orchestras revisited Australia between 22 January and 2 February 1999 for 7 concerts and 4 Festivals: The Sydney Festival (22 Jan), The Age Melbourne International Jazz Festival (23, 24 and 26 Jan), (Tasmania): The Latrobe-Sorell Summer Festival (29 Jan), The Hobart Fringe Festival (30 Jan), (Far North Queensland): Kundara Rainforest Resort (2 Feb). The NJO was presented by Henk van Leeuwen - Australia Northern Europe Liaisons - with the support from the Danish Music Council and the Danish Jazz Federation. The first NJO Australian tour was in February 1995. 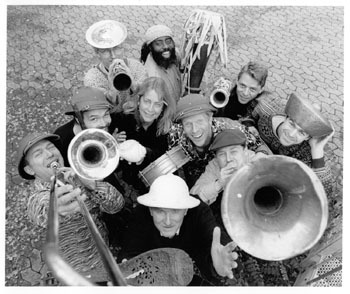 The 'New Jungle Orchestra' (NJO) was formed in 1980 and named after the legendary growling "jungle" sound of the early Duke Ellington Orchestra. NJO plays high levelled world music rooted in jazz. The ensemble consists of 10 musicians and is unabashedly one of Europe's most sophisticated jazz bands. It has a penchant for transforming various 'world' music elements, particularly those from West Africa and the Middle East into a fascinating and pleasurable musical experience. Pierre Dorge's music is exotic, rhythmically vibrant, sophisticated, accessible, and it puts the fun back into jazz. Pierre Dørge's NJO is a true 'world music' ensemble that straddles all genres of music. It was appointed as the official Danish State Ensemble between 1993 and 1996, and came to Australia for the 2nd time in 4 years. NJO appeared in Sydney on 22 January for the Sydney Festival, followed by 3 concerts for Melbourne International Jazz Festival, 2 Festival concerts in Tasmania, and 1 in Far North Queensland's rainforest of Kuranda. Pierre Dørge is one of the most prolific and wide-ranging figures on the Danish jazz scene today. His has been interested in modern jazz almost from the beginning of his career in 1960. But through the years he has also shown curiosity about other cultures and genres. Thus elements from European, Asian, African and Afro-American music traditions have been assembled by Dørge into an original synthesis. He has been working in bands with John Tchicai, Niels-Henning Ørsted Pedersen, Svend Asmussen, Johnny Dyani, Don Cherry, David Murray, Harry Beckett, Marilyn Mazur, o.a. In its 18 year history the NJO has fascinated and inspired audiences around the world in at least 34 countries and given over 500 concerts. In 1995, audiences in Kiama, Melbourne, Adelaide, Perth, Brisbane, and FNQ raved about this group. Pierre Dørge has recorded more than 30 albums in his own name, and since 1982 the NJO has released 14 records. "The Danish guitarist creates an exotically hued, rhythmically vibrant music that is simultaneously sophisticated and accessible. Piere Dørge's NJO has been one of jazz's most consistently engaging big bands of the last decade." "...one of the most original, exuberant, and, dare I say, fun jazz concerts seen for some time, sentiments that seemed to have been shared by the capacity crowd that attended the centrepiece of the Kiama Jazz Festival"
"..The NJO's message is that the American jazz tradition can be used as the basis for a contemporary style of music that incorporates stylistic ideas and attitudes borrowed from a variety of sources, from West African rhythms to Danish folk songs......Few do it with quite so much imagination, zest and humor as this ten-piece little big-band." "Encores are rare at the Hyde Park but the audience requested and was rewarded. It was a thoroughly enjoyable evening of superior musicianship in a style and conception rarely heard in Perth"